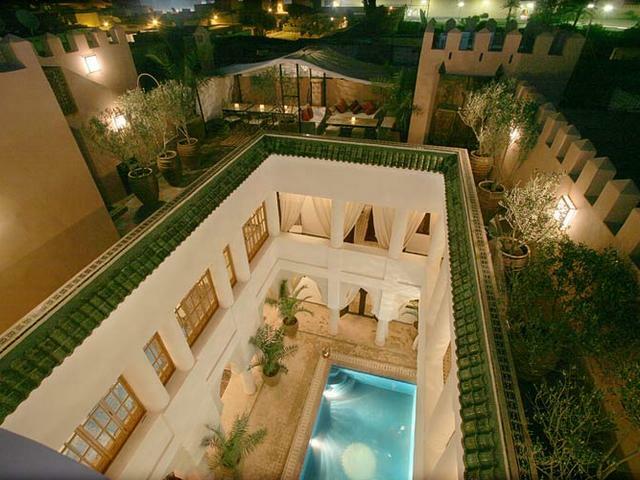 Riad Shemsi - Luxury Riad in Marrakech, Morocco. 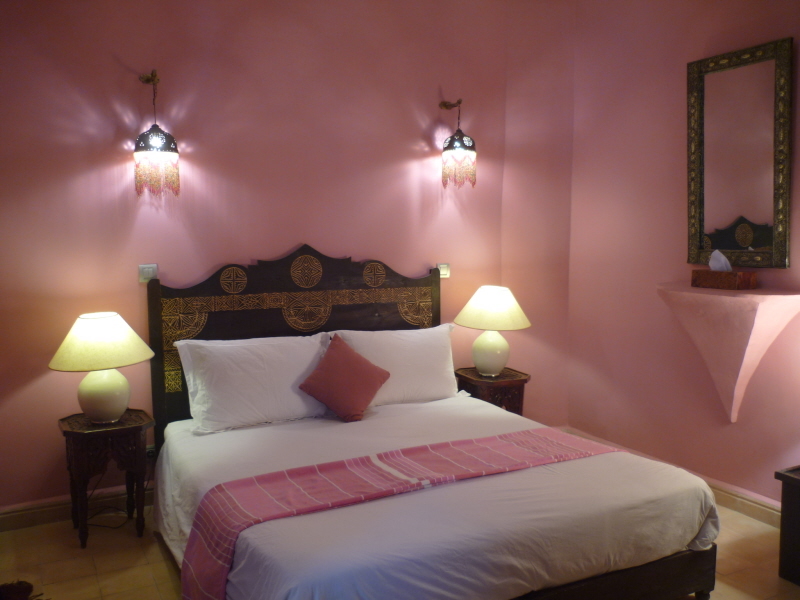 Book Riad Shemsi Today with Hip Marrakech - specialists in English Speaking Accommodation in Marrakesh, Morocco. 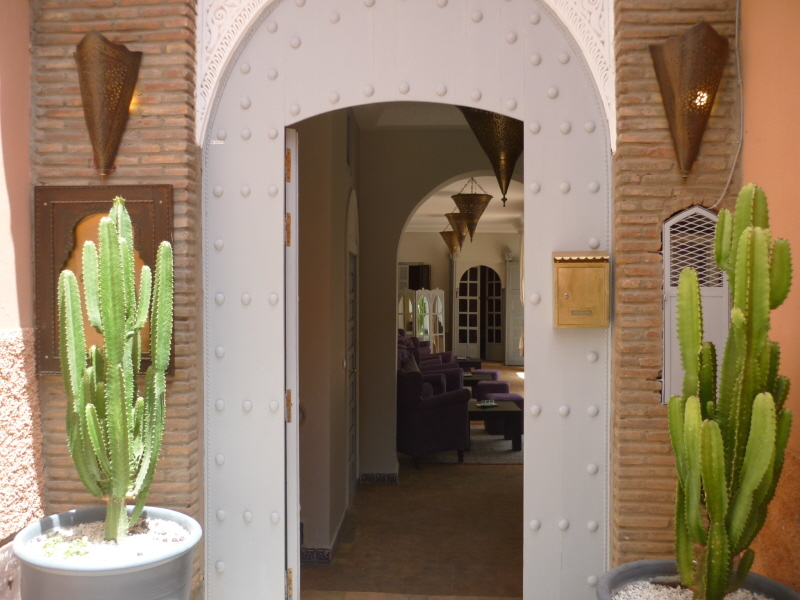 "After the heat and hubbub of the souks, a tranquil haven where authenticity and refinement meet..."
Situated in the heart of the Royal Kasbah district, the beautiful and elegant Riad Shemsi has been created from an authentic traditional house. Today it stands as a haven of tranquility with large courtyard containing a substantial pool surrounded by traditional arabesque arches; antique and vintage tapis; palms and beautiful flowers; distinguished Marrekchi furnishings and stunning panoramic view of Marrakech. The Riad Shemsi staff are warm, attentive, discrete and ever welcoming and are always on hand to ensure all your dreams come true. The beautiful salon with its open fireplace is a wonderful place in which to savour the delights of the celebrated Shemsi cuisine and excellent Moroccan wines. Alternatively, take your evening meal on the atmospheric terrace with its subtle Moroccan lighting. The six stunning chambers are all en-suite, revealing traditional coloured tadelakt plasterwork, finely worked mirrors and contemporary art. 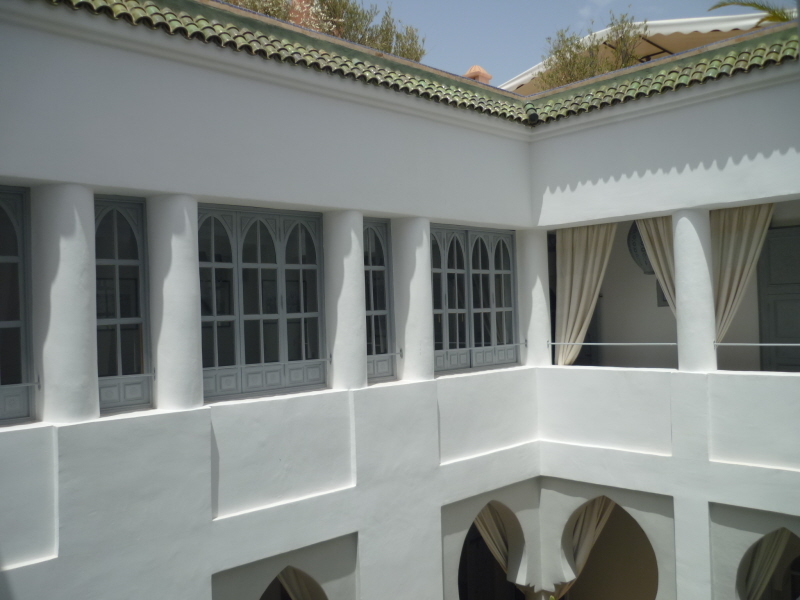 Riad Shemsi is located just minutes from the Saadien Tombs and the Royal Palace, and within a short distance of the wonderful myriad Souks and Jemaa El Fna. 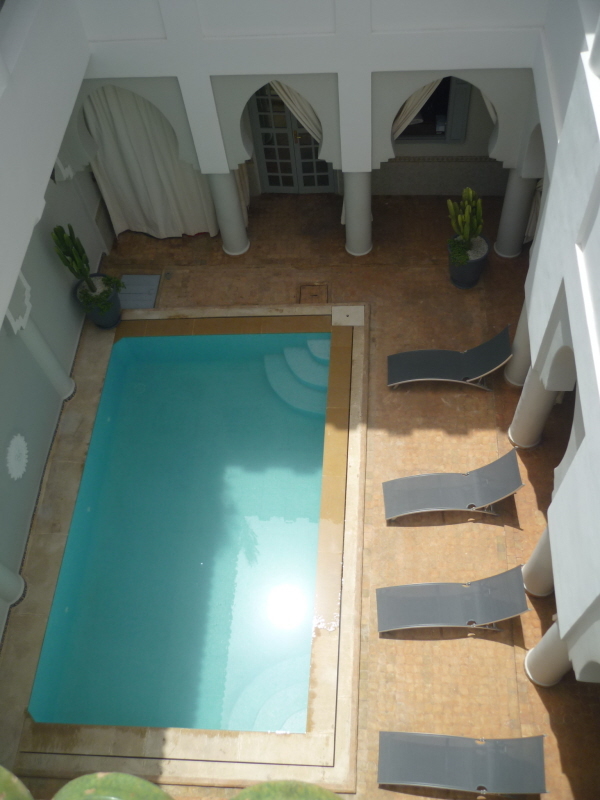 Regrettably Riad Shemsi is not suitable for children under the age of fourteen, unless part of a group that occupies the whole house, due to the unguarded pool and elevated terraces. Base prices are in €Euro. : £Sterling, USD and Moroccan dirham rates will vary by exchange rate. A charming room finished in tones of clementine orange and fine hand worked silver lanterns, complimented with discreet North African furniture. Room features: Reversible air conditioning, personal safe, free WiFi, hairdryer, bathrobes, towels and toiletries from Les Sens de Marrakech. The romantic Berber room offers a superbly atmospheric space, perfect for a romantic retreat or travelling friends. 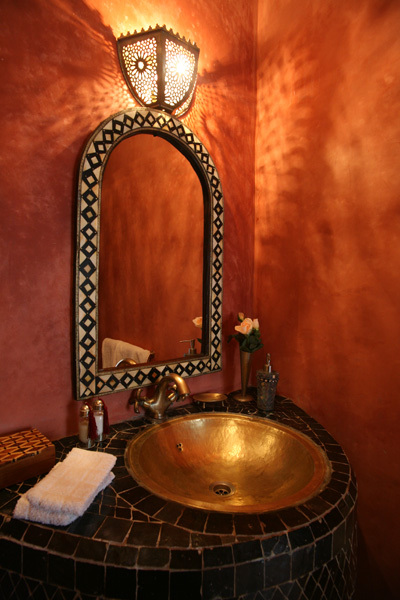 Finished in tones of pomegranate with traditional Berber lighting, this room is available as a double or twin. Double room, with extra bed on request. 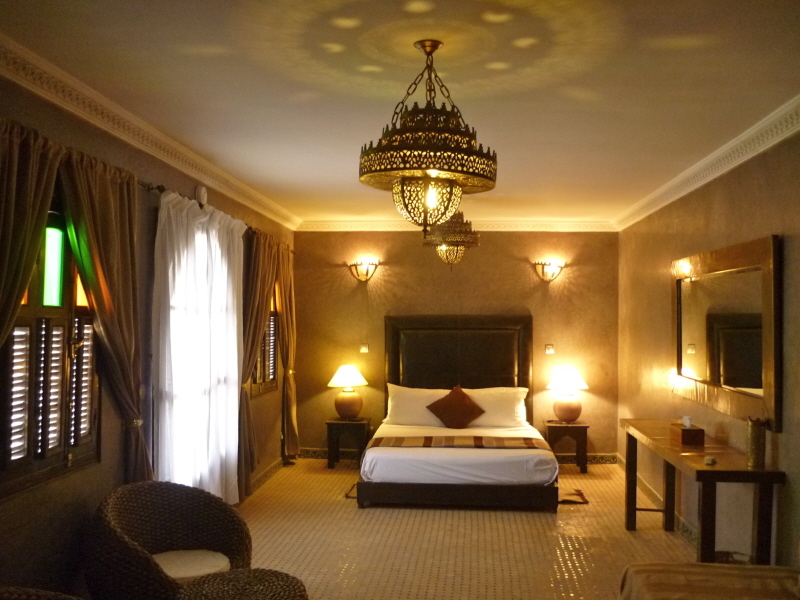 This elegant Riad Shemsi room finished in traditional beige tadelakt with fine art, a fine mirror, traditional Marrakshi furnishings and a Queen sized bed. 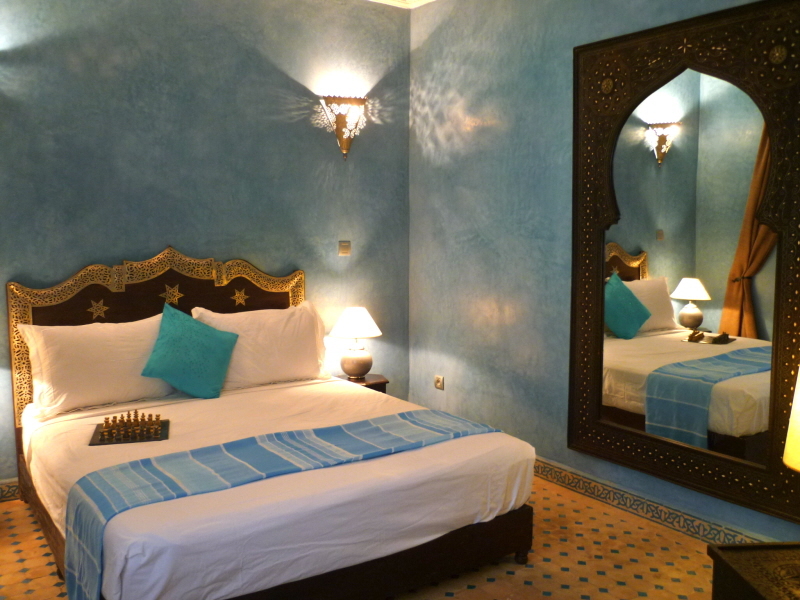 Painted in a cool, calm turquoise, this room is finished in a stunning tadelakt in the traditional Moroccan style. The walls are elegantly counter pointed by silver lanterns and exquisite Berber mirrors, handcrafted in hardwood and silver. The room also offers a large en-suite bathroom and Queen sized bed. Double or Twin room, with extra bed on request. 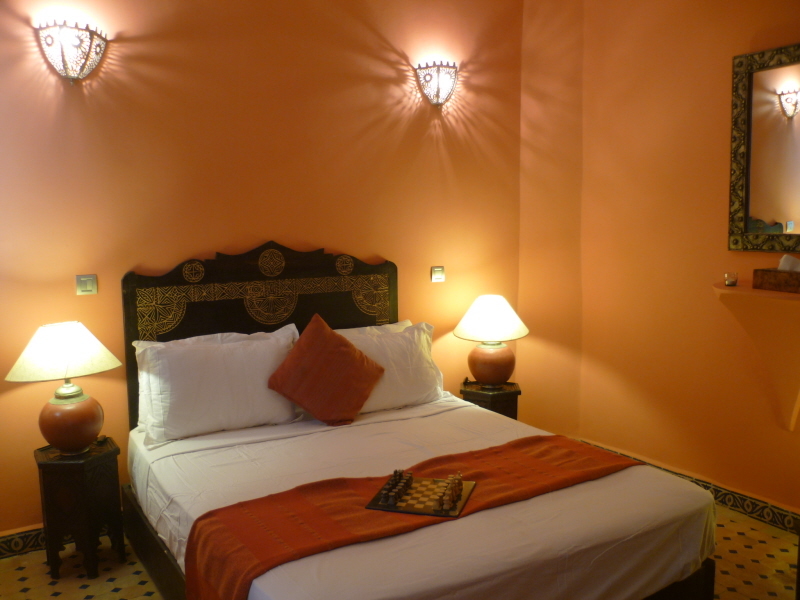 Situated on 1st floor of Riad Shemsi, this room is finished in traditional orange tadelakt and features traditional North African furniture, hand worked brass full-length mirror, beautiful brass lanterns and an en-suite bathroom. Sumptuous suite in rich chocolate traditional tadelakt. Fine handmade mirrors and furniture, with a large en-suite bathroom. Situated on the first terrace level, this rooms receives the early morning sun and the song of native finches and a beautiful, natural wake up call! 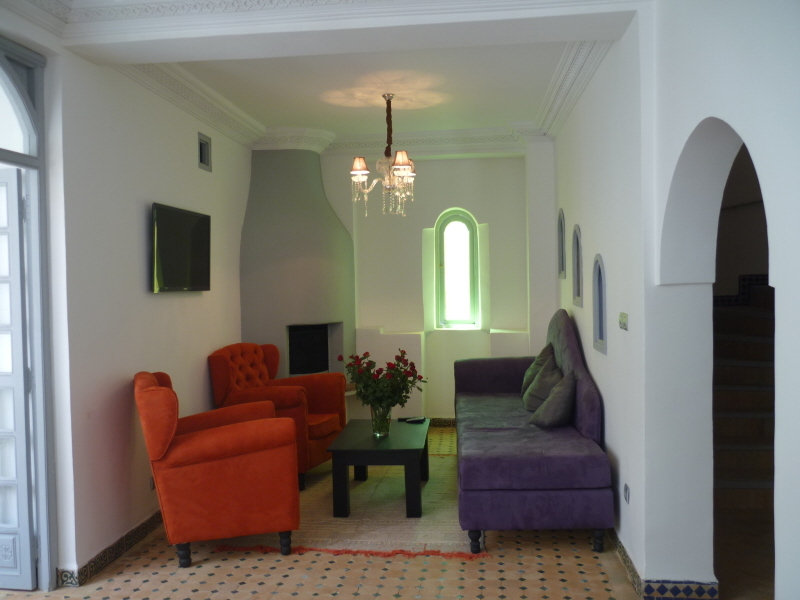 Riad Shemsi is available exclusively, with use of the sumptuous Chocolat Suite, the elegant Orange Mini-Suite, and four further charming rooms, accommodating up to 12 guests. For a supplement, three of the rooms can sleep a third adult if required, allowing up to 15 guests in total. *A minimum stay of 3 nights is required. The base rate price at Riad Shemsi is in pounds, euros, or Moroccan dirhams and exchange rates are approximate. Breakfast: Is a delicious table of fresh bread and home made Berber crepes, locally produced eggs, home made Riad Shemsi yoghurt and fruit compote, fresh fruit, locally produced honey and jams and fresh pressed orange juice, ground coffee, English tea, green and mint tea. Lunch: Light salads, omelettes, sandwiches and fruit (including melon and cactus fruit when in season) – may be ordered at any time throughout the day. Dinner: Comprises 3 delicious courses of Moroccan and International cuisine sourced and prepared daily to order (25 euros per person excluding drinks). Sample menus include lamb, beef, chicken and vegetable tagines, very slow cooked lamb and beef “mechoui”, freshly caught Atlantic fish from Essaouira, and a wide variety of vegetarian dishes including Berber aubergine and courgette dishes and gently spiced pilaf with green lentils. If you want a change of scene, there are plenty of great restaurants nearby. Even if not booking through HipMarrakech, we suggest you download the Hip Marrakech App since it will give you 10% discount on meals at selected restaurants and will show you their location. Download the Hip Marrakech App for restaurant and excursion guide as well as a map of Marrakech. Cuisine: Western dishes inspired by Moroccan cuisine. Reasonably priced food in relaxed surroundings. One of the highlights of the fashionable Kasbah district. Cuisine: Authentic Moroccan dishes cooked to a high standard. Named after an authentic Moroccan lamb dish, La Tanjia serves traditional Moroccan food accompanied by beautiful sunsets, wonderful interiors and, on most evenings, belly dancers for entertainment. Cuisine: Moroccan classics as well as international dishes including Sushi. Perhaps the best place in Marrakech to watched the sun set whilst enjoying a classy meal and a glass of wine. A large eaterie at night offering authentic Moroccan street food. Popular to locals and tourists alike; very cheap, fresh food, avoid the salads. Not to everyone’s taste, but a great experience nonetheless. Riad Shemsi can arrange excursions and activities to make your stay in Marrakech even more memorable. Private trips with good quality transport. Our rates include the cars, driver, petrol (but not any meals or drinks unless specified). Asni and Imlil Valley – Drive time 1.5 hours each way. Ourika Valley and Village of Setti Fatma – Drive time: 1 hour each way. Essaouira - Journey time: 2.5 hours each way. Kasbah of Ait Ben Haddou - Journey time: around 3 hours each way. Alternatively, here at Hip Marrakech we also offer a variety of excursion and tours in and around Marrakech from day trips to the Atlas Mountains to day trips to the desert. 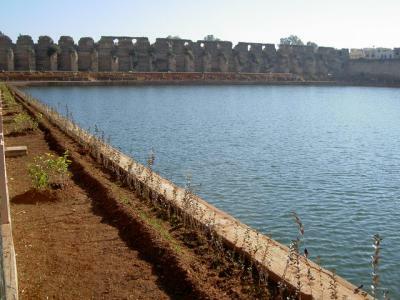 Even if you are not booking your accommodation through Hip Marrakech, you can book your trip an excursion with us here. You can also book trips and excursions via the free Hipmarrakech App. The Hipmarrakech App also gives 10% discount at selected restaurants and shops and provides a map of Marrakech which does not require data roaming so you can navigate the Medina without getting lost and always being able to find your Hipmarrakech Riad or Hipmarrakech Hotel. 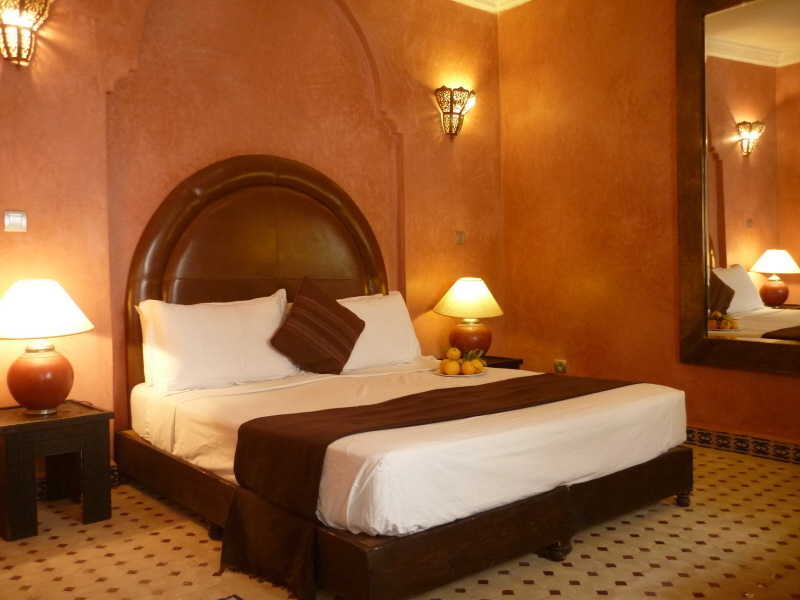 "If you are lucky enough to book a room at riad, your journey will be extraordinary. Why? because they will take care of you like one of the family, because the riad itself is amazing with its fine decoration and precious details everywhere. The sunset on the Riad's terrace is one thing you could not ever forget. 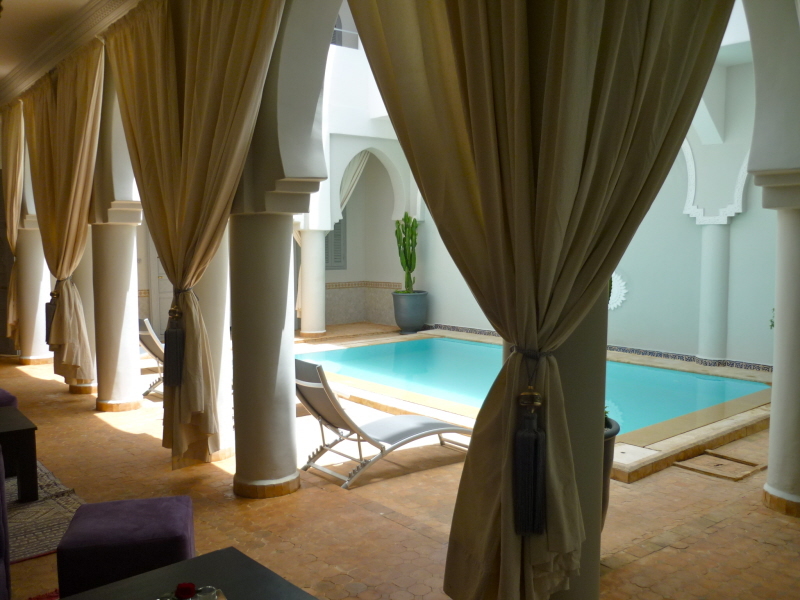 I would recommend Riad Shemsi to everyone: from young couples to women who love to travel alone. It's the perfect location to enjoy the real flavour of Marrakech." "I wanted to say thank you to you and all your staff for a wonderful stay at the Riad Shemsi. 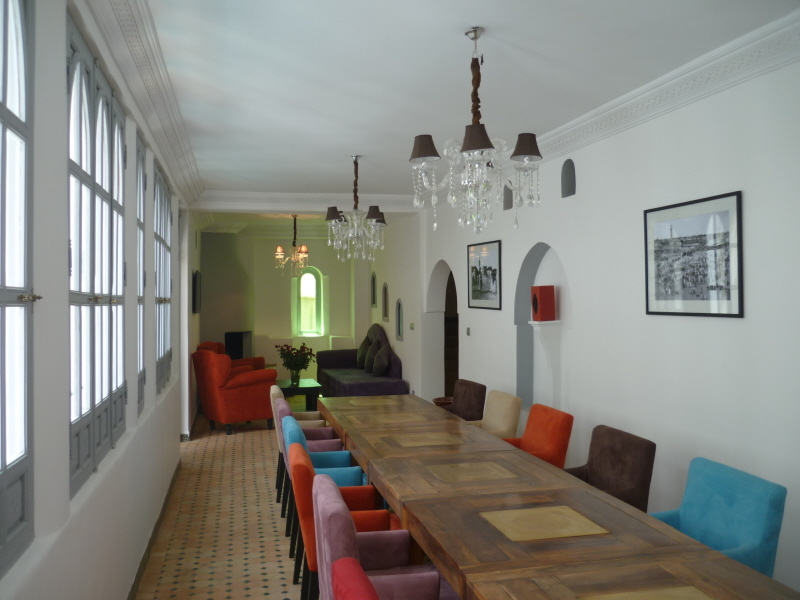 It was such a clean and pleasant riad, and everyone who worked there was so friendly and professional. I would be happy to recommend your riad to any of my friends and family. Thank you for all your help in making our trip such a happy time in Marrakech." "There are a few twists and turns down narrow alleys to reach it but when you do there is an oasis of calm behind the large wooden door. Spotlessly clean, stylish and such lovely staff. 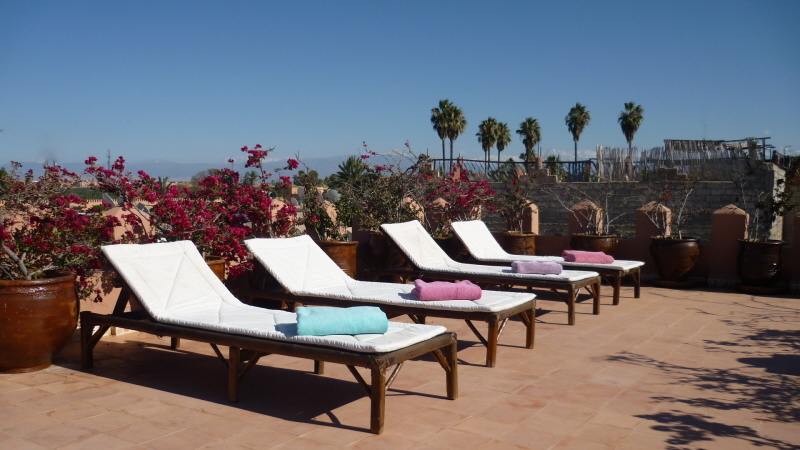 Make sure you check out the lovely roof terrace. The breakfast was great and the mint tea and pastries much appreciated. The room was lovely with a really comfortable bed and good shower... I would definitely encourage you all to stay here." 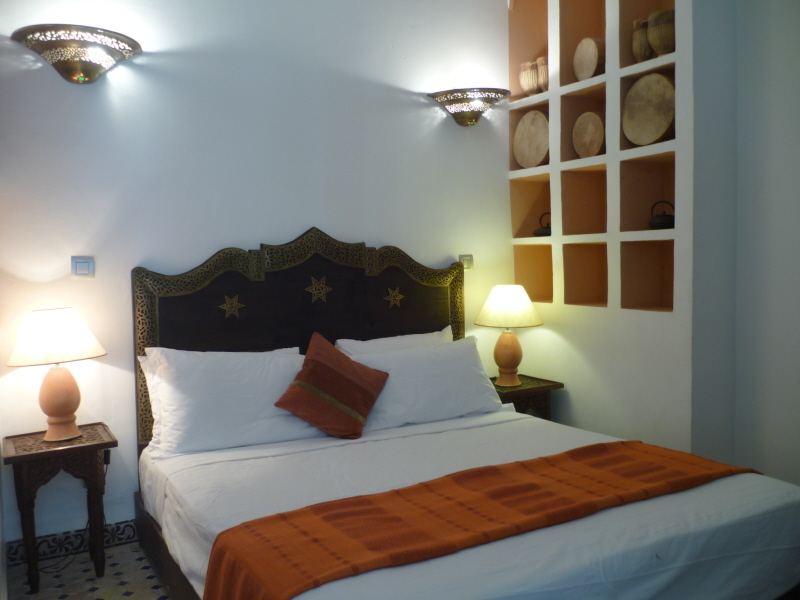 "The Riad is truly beautiful, only 6 rooms, very peaceful, each room traditionally but stylishly decorated with air conditioning, great showers, delicious Bains de Marrakech soap, shampoo, shower gel and body milk, a safe in each room and very firm mattresses! Plenty of towels for the bathroom and by the pool and large towelling robes which we used by the pool as well. Most importantly for our 2 daughters, free Wifi throughout the Riad!" "I am a rather spoilt traveller, who usually stays at ridiculously over priced resorts and hotels - and I'm usually rather disappointed. Riad Shemsi is by any standards, world class. We will definitely return again soon." "The free Hipmarrakech App has proved amazing for our clients. It gives them confidence to navigate the medina knowing they can always find their way back our house, even with NO data roaming switched on. Further it locates many restaurants in Marrakech that our guests like (some of which give discounts to those with the App), and then helps them find their way back to the riad easily. 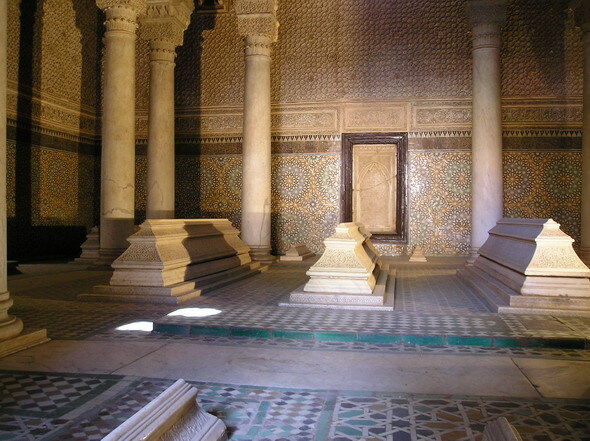 Further, they can also book excursions in or around Marrakech at short notice." 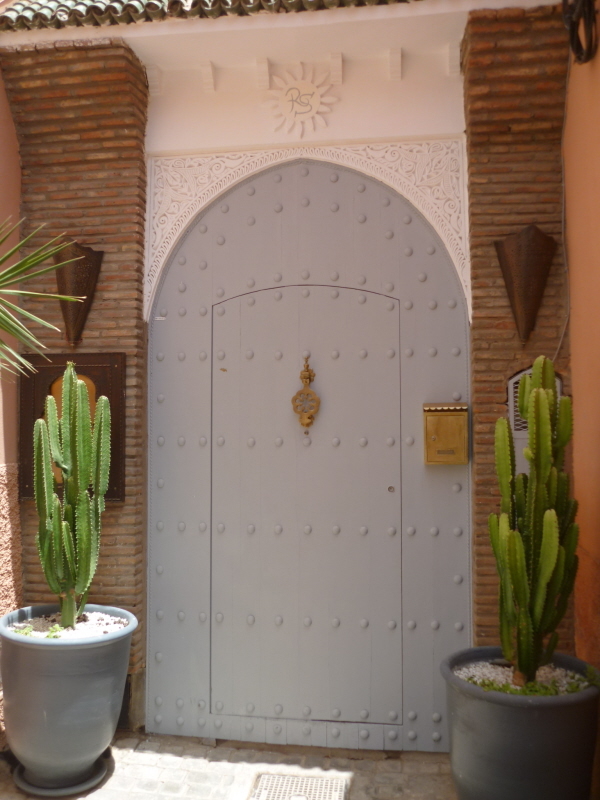 Riad Shemsi is ideally located in the Royal Kasbah district of the historic Marrakech medina, just minutes from the Royal Palaces, the Saadien Tombs and the the Agdal Gardens, together with the whole Marrakech Medina and Menara Gardens. Just south of the main square of Jemaa el Fna, the Royal Kasbah district is unique for its wide, clean walkways, and calm, authentic local atmosphere. Good access to the surrounding road network means easy access to modern Marrakech – the Gueliz district – with its many excellent restaurants, cafes, boutique shops and art galleries, and also the outlying resorts and day spas. 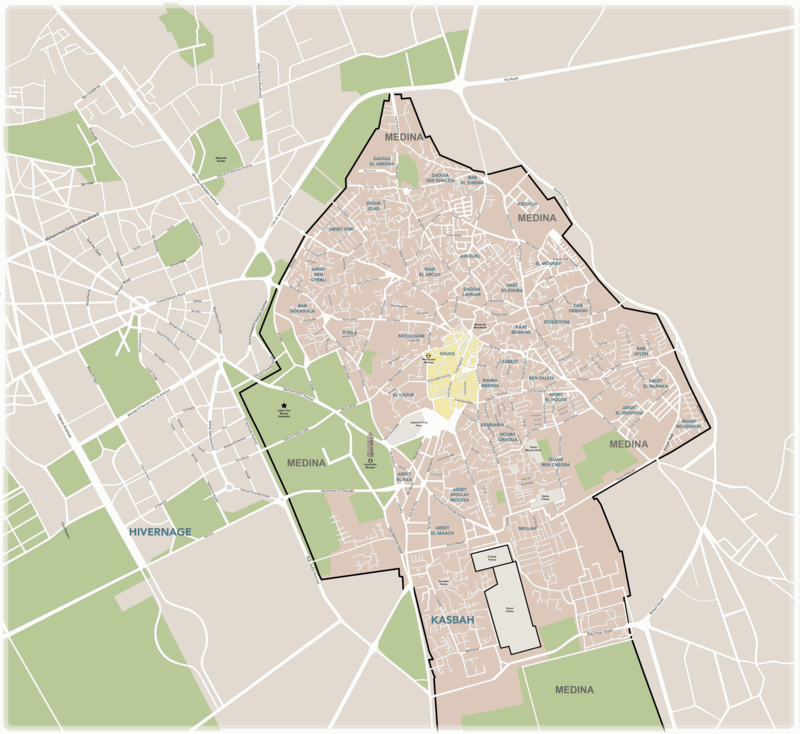 Location on Hip Marrakech App with data free roaming Map. Download the Hip Marrakech App for restaurant and excursion guide as well as a map of Marrakech. Best Price Guaranteed! All prices match or are lower than those charged directly by Riad Shemsi. 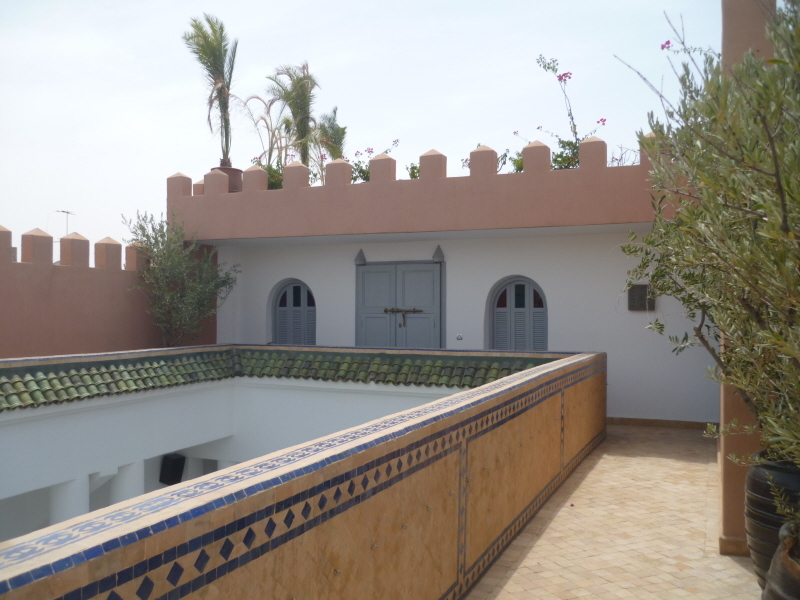 We can check availability at Riad Shemsi for you, process your booking and assist you in finding alternative dates and accommodation if your first choice is already taken. 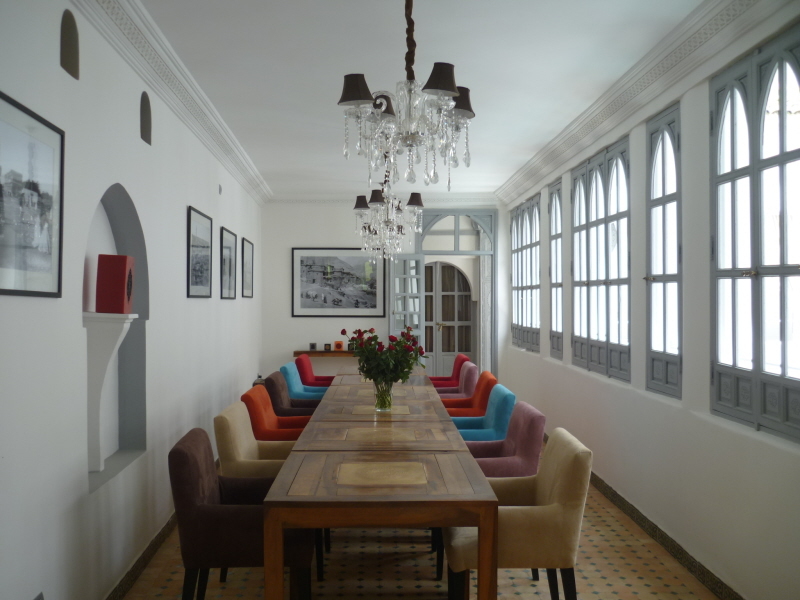 Every member of our team has expert knowledge of each riad including Riad Shemsi and can provide more information about the rooms, the location and how well suited it is to your specific requirements.